008 The Movement and Upper Playground strike again ~ for Obama! 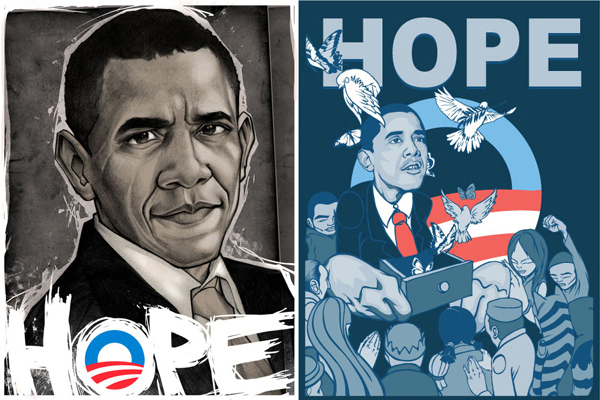 The artist collaborations they have been coordinating are incredible, regardless of whether you support Obama, it’s hard not to be in awe not only of the way that Obama’s campaign has been designed, but also how impeccably designed/inspired/executed the unofficial art that has come out to support him has been as well. Here are the latest limited edition posters (which you will probably be seeing popping up around soon as well) - from Munk One, and long time NOTCOT favorite, Sam Flores. If you’re looking to get one of these limited editions, move quickly, because the last ones from the MAC, the Date Farmers, and Obey/Shepard Fairey (and the shirts as well) have sold out nearly instantly. You can still get Shepard Fairey HOPE stickers here. To side step slightly… did you hear that Obama wrote Shepard Fairey a thank you note? And that it might be sanctioning him to create street art on stop signs? Will this really become a free pass for street artists? (yes, a bit of reading between the lines by shep on this one, but i think its a nice move that Obama and his people acknowledge the influence of the medium.) 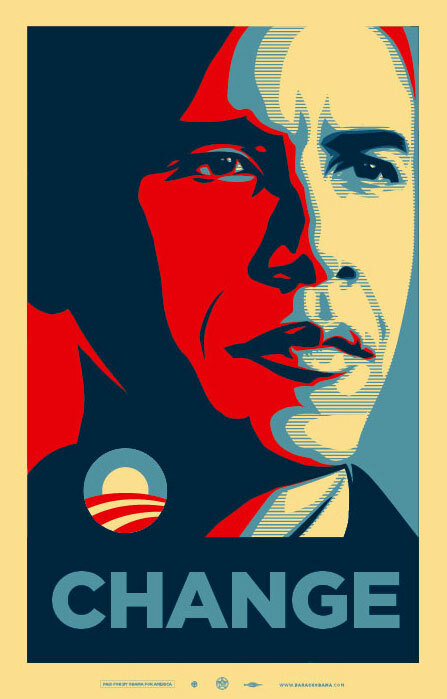 And the unofficial artist posters in support of him have been so influential and successful, that Obama’s official campaign has even Artists for Obama gallery with limited edition prints, the first being a CHANGE version of the Shepard Fairey poster. And as a special something for our NOTCOT/Obama supporters - i’ve also gotten my hands on a few of the Shepard Fairey HOPE posters and stickers, the MAC posters, and Date Farmers posters… i haven’t been sure how to give these away yet, but how about those interested in helping the cause - comment here with where you’d put them up and we can try to send some out to you in exchange for some pics of where they go? Here’s the letter that Shepard Fairey received! Sorry ~ no pics of the shirts, tees, and mini Date Farmer posters yet… super sleepy and packing right now! Awesome images! Very well done. The whole world is watching! You are doing great work. Best Wishes! Peace. please let me know if it’s not and ill change the picture! thanks so much a have a wonderful day! i live in sf and would love to put these posters in our window. hey I want to make some tshirts using your obama design…is that possible? all proceeds are going to the campaign. I have a print shop and clothing store helping to fund this project and need an eps file to make the shirts. is this possible? please let me know. I like the hope poster. of Obama on our gift boxes? Open for discussion? Where is The Date Farmers Obama Poster? You should post a picture of that one. I am Obama support deep in the heart of Bush country, Dallas, TX. The Obama movement has left Bush supporters in Texas with an overwhelming fear of inevitable defeat….and I LOVE it! Your artwork is inspiring, and if i had the honor of displaying it, here in the Heart of Texas…well, I’m hoping to inspire more to join the movement, and help him win in Novemeber. I would promanantly display this in a protected glass incasement, near a public transit area….not far from Southern Methodist University. The site of the future Bush Presidential library. Please consider my offer. Thank you! how do i get ahold of some of this work? i live in vancouver canada and even though we arent american there is a strong support here for obama. Hello there, I have volunteered for Senator Obama in South Carolina, Ohio, Pennsylvania, North Carolina, and Indiana. I’ve been trying my best to earn a poster the hard way, by canvassing, knocking on doors, and registering people to vote. Unfortunately, I have yet to break the seal. I don’t know what else to do to get one. I was considering registering people to vote this weekend, but I am attending Camp Wellstone. However, I do plan on setting a goal of registering 100 people in Washington DC to vote before the November general election. My target age is 18 to 25. Well, thanks for listening. If you know, anyway that I can earn one of the three posters, I’d greatly appreciate it. I also, saw a guy with the hope poster on a t-shirt. It probably was unofficial, but if you know where to get one, please let me know. Thanks. Hey everyone ~ thanks for all the enthusiasm, we’ve just run out of posters/stickers - but we never know, the right comments might always convince our sources to pass a few more our way. I would march around the streets with the posters on a sturdy wooden pole like that crazy “12 Galaxies” guy, only I’m not Asian. To hell wit that. I’m gonna make some OBAMA STENCILS so EVERYBODY can just download a copy, cut, and spray anywhere they want! And it’s gonna be dope! Holla at your boy. 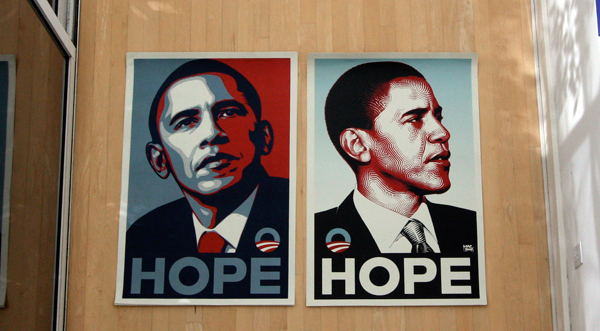 We would love to have one of the original HOPE posters. We live in Houston in an older,progressive neighborhood near downtown. There is a great mix of folks here,very eclectic, and we would put our poster(s)(one can always hope) in our windows facing 2 different busy streets in the neighborhood. Love the art. Nice job. Hello, I am a Graphic Designer living in Denver, Colorado. I have already done a lot of creative for Obama. I have created posters and buttons for both his Denver office and his home base in Chicago. You can see the posters in the ‘OBAMA’ section of my website (www.changethethought.com). 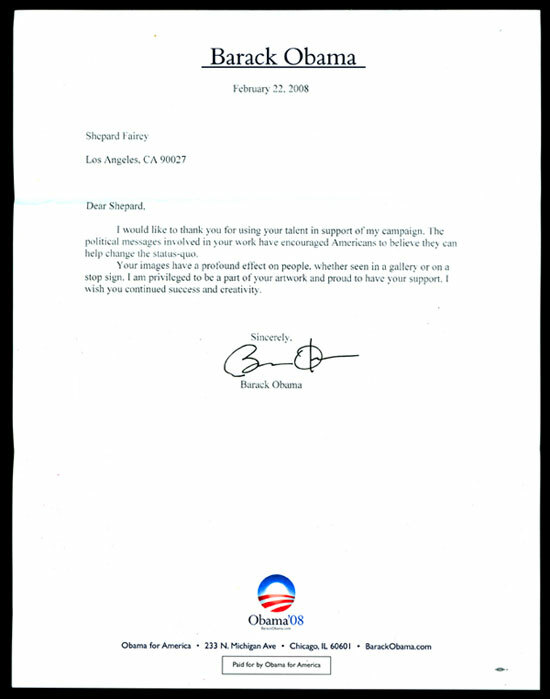 I haven’t received any thank you letter from Obama because I am not famous. I didn’t do the work to get credibility from the art community however, I did them to help Obama get elected and give others a resource for free graphics that they could use to do the same. If I were given the posters, I would frame them and most likely hang them in my office at work. I would consider them a memento to a campaign that I did everything I could to contribute to. Well, I currently live on a college campus in Maine but I will soon be going home to Boston, and I would display the posts prominently in both areas. I’m a designer myself, and these posters are beautiful. If I had a poster, I would hang it in my office at work so that when things got frustrating, when I felt uninspired, I could look up and remember that design can say more than just existing as ink on paper… that great design can make you dream, and hope and push on towards tomorrow. i’d put them all over my new busy street-facing 18’ garage door…one, because i’m an o.b. supporter…two, because, i can’t decide what color to paint it. I live in a 2 building high rise complex in downtown Minneapolis that houses nearly 1000 people and fronts a busy street with a lot of bus traffic. I’d put the poster in my window. Loads of people would see it. i live in corvallis or, we have an anti-war, anti-bush protest every week in front of city hall. i always honk and wave as i pass by the senior citizens who put on the protest. i’d laminate a poster and go out and join them (finally)! Simply, I beleilve in history and collect and display as much as possible. 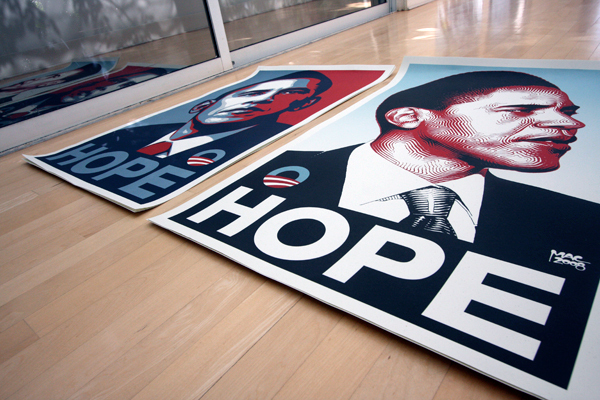 I think it would be great to own something of the election of 2008. I haven’t collected anything (posters, buttons, etc.) from this election and it’s a bit disappointing. I think I would display it in my bedroom window, it is in the front of the house on a very busy street. Everyone would see it. I live in Brooklyn over a warehouse and have been having a weekly battle a anonymous worker over Obama stickers on our building door. Every week I put one up….. every week they peel it off and (oddly) stick it on something at ground level. I tried putting up 2 and they ended up torn up and placed around a fire hydrant. I’m ready to up the anty and fill my windows with Barack so that this mystery Obama hater is foiled once and for all! Who knows maybe “the splasher” will pay me a visit! I would sell them on ebay to europeans, then take that money and spend it. All to help in the stimulation of the American Economy. My uses for the items would be much more modest. I work with a very trusted company in our area of Southern Indiana, unfortunately it is also very conservative. I am among the youngest of the employees at 27 years. I hear much about that other party but no so much about the people who could actually effect change. My office is situated at the end of a hall that all of our clients pass through and it says so much as a graphic designer to have a gorgeous image hanging in plain sight that makes a very direct statement. Statement’s aside - these artists have done an incredible job with their time and resources. Kudos! I live in Brooklyn but I’m planning at least one trip to Pennsylvania in the coming weeks to help out wherever I can. Would love to throw up any Date Farmers posters, stickers, Hope posters, etc. while we’re on the road through this new battleground state. Wow, I would absolutely cherish displaying one of these posters on my school campus. I’m a college student at Portland State University, and I would probably display mine on my dorm room door or next to my dorm room door (they let us apply posters to the wall outside our doors as a communal art type thing). Either that or I would display it from my dorm window and the thousands of students that pass by could see the poster filling my window. I think I’m going to go order a few of his stickers to spread around campus since they’re nice and big. I would display the posters as a traveling exhibit in Chicago. Take the posters to various locations, book stores, restaurants, or coffee shops, this would spread the power of the images to a larger audience. Posting pictures of the various display locations online beckons a fresh twist to the traveling gnome idea. The artist’s grass-roots support of Obama is a prime example of what makes our country great! I’m part of several student interest organizations at Indiana University trying to rally support for Senator Obama and it really is a testament to his charisma and vision that so many people have dedicated their time and tremendous talents to spread his message and support the campaign. Many of Obama’s detractors say that his calls to action for Hope and Change are merely idealistic pandering and pipe dreams… but, to borrow a line: Every story has a dreamer, why can’t ours? These posters could create awareness of his campaign in our Memorial Union, the library, and across campus. Indiana’s a conservative state that has yet to have its primary so my fellow students and I are fighting for every single voter that we can inspire to get out to the polls. Long-winded rants aside (apologies), this collection of artwork is amazing and, in my own opinion, serves a valuable and noble purpose. I live in a house on a very busy intersection in Los Angeles- 6th st and crescent heights-I would probably put the posters in several windows which are fully visible to anyone driving by. My neighborhood is also very walking friendly and people are always walking by and would obviously see the posters in the windows. I also work in the Wiltern Theater Bulding-I would figure out a way to get one into the display area of the theater and probably stick one on the elevator ceiling. Shepard Fairey/Obey’s office used to be in our building but i haven’t seen them around lately..they may have moved? i would love to spread the obama hope around the city! !